Founded by Phoenix businessman, George H.N. Luhrs and completed by his son, George Luhrs Jr., the Luhrs Building was Phoenix’s first 10-story high-rise when it opened with great fanfare on April 1, 1924. Built at a cost of $553,000, this L-shaped neoclassical building was designed by the El Paso architectural firm of Trost & Trost to include a striking brown brick facade, elaborate marble ornamentation on the uppermost two floors and a prominent rooftop cornice. 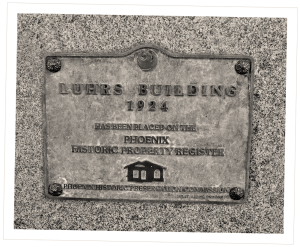 The Luhrs Building was Phoenix’s first 10-story high-rise. The Luhrs Building served as the home to the prestigious Arizona Club. 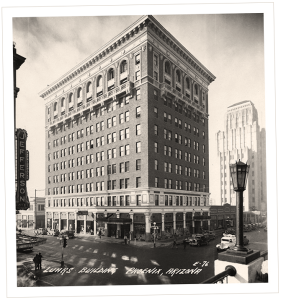 Up until 1971, the top four floors of the Luhrs Building served as the home to the prestigious Arizona Club, the 10th floor penthouse featuring a 22-foot-tall arched ceiling, crystal chandeliers and unprecedented Valley views. Now listed on the Phoenix Historic Property Register, the Luhrs Building has been completely restored to its former glory. Housed inside the Luhrs City Center, Luhrs Tower is a 14-story Art Deco masterpiece listed on the Phoenix Historic Property Register (1929). 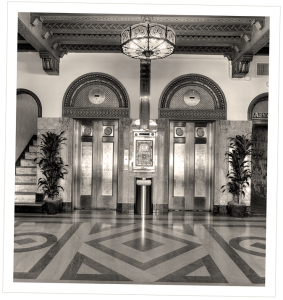 For decades the tallest building in the Southwest (185 ft.), this timeless office tower combining striking Art Deco styling with regional Southwest & Spanish colonial influences, has been artfully restored with state-of-the-art amenities. 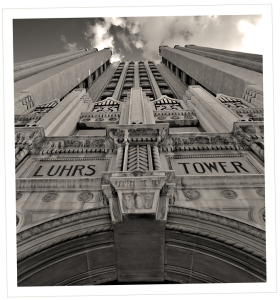 Luhrs Tower is a beautifully restored 14-story Art Deco masterpiece. For decades Luhrs Tower was the tallest building in the Southwest. Located at the SW corner of 1st Avenue and Jefferson Street, just south of CityScape, a select number of flexible, built-to-suit office suites are now available. Luhrs City Center sets the tone for Downtown Phoenix’s historic modernization efforts with quintessential 1920’s charm, state-of-the-art amenities courtesy of $10M+ in capital improvements, and urban access to Metro Light Rail, walk/bike access, and a dedicated parking garage on-site.